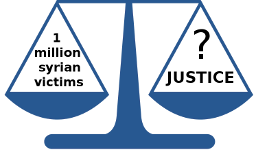 What follows are a few legal things that can be found on most websites in very small letters..
TheSyrianPetition.org (along with all translated versions of which hereafter referred to as the “Site”) is operated by The Syrian Petition (“We” or “Us”), a non-profit organization from Belgium (Brussels-Antwerp) which aims to effectively sue and try those responsible for the genocidal massacre in Syria. By accessing content on the Site, you agree to be bound by all of the terms of this User Agreement. The Syrian Petition reserves the right to change the terms of the User Agreement or to modify its features at any time. The Site will post changes to the terms of this User Agreement at http://wp.me/P8jT6z-2K, and by accessing the Site after modifications to this User Agreement have been posted, you will agree to be bound by all the modified terms. You agree that your access to and use of the Site’s content shall be at your own sole risk. We don’t collect data ourselves, apart from those you submit when you register your support committee and those necessary to process financial transactions. Subscriptions to our newsletter are managed by the WordPress.com site.